State Minister for Transport, Works and Housing, Hon. Richard Azan (2nd left), is assisted by Jamaica Emergency Employment Programme (JEEP) Director, Carolyn Gardner (centre); and Mandeville Mayor, Councillor Brenda Ramsay (2nd right), to cut the ribbon at Thursday’s (June 11) re-opening ceremony for West Road in Cobbla, Manchester. The road was rehabilitated at a cost of $6.5 million, under Phase Four of the JEEP component of the Ministry’s Major Infrastructure Development Programme (MIDP). The 1.9-kilometre West Road, which serves residents of Cobbla and adjacent communities in North East Manchester, has been rehabilitated by the Ministry of Transport, Works, and Housing, at a cost of $6.5 million. 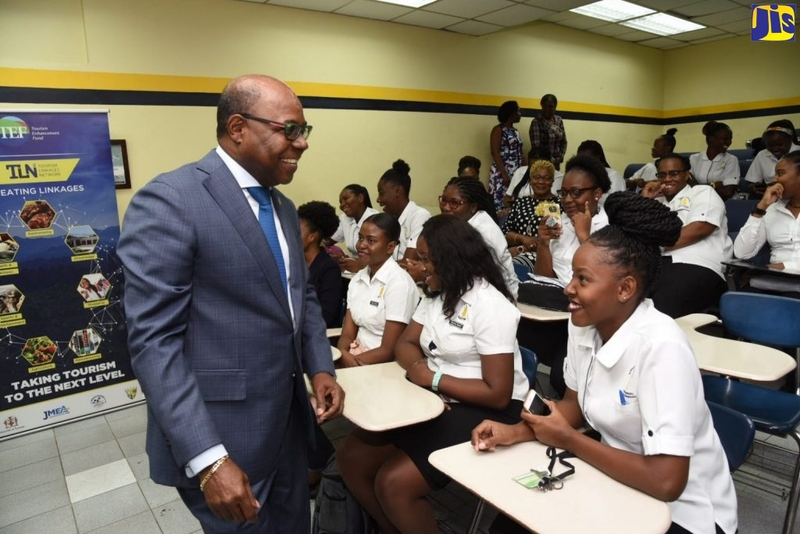 The road, which had deteriorated extensively, was repaired under Phase Four of the Jamaica Emergency Employment Programme (JEEP), a component of the Ministry’s Major Infrastructure Development Programme (MIDP). Work on the two-week project, which was completed in March, included paving of the roadway and construction of drains and verges. This project complements similar works carried on other roads in the constituency and wider parish, under various programmes administered by several agencies, including the Jamaica Social Investment Fund (JSIF). West Road was symbolically re-opened by Transport, Works and Housing State Minister, Hon. Richard Azan, on June 11. The State Minister emphasised the need to effect road repairs, particularly within communities, and to maintain the corridors. To this end, he said there is need for property owners to pay the requisite taxes to assist in facilitating road maintenance programmes. He urged the Manchester Parish Council to ensure compliance by property owners. “The Council must insist that every person who has property on West Road (and other roads) must pay their taxes…to ensure that we maintain this road, and others. We have to make sure that everyone plays his or her part in what we are doing,” he stressed. Meanwhile, Mayor of Mandeville and Chairperson of the Manchester Parish Council, Brenda Ramsay, said the West Road project represents a “mission accomplished” for the Council, which recommended it for rehabilitation under JEEP. She also encouraged the residents to assist in maintaining the roadway. “Even if we (Council) don’t get to it with the regularity that we should, if there is a drain that is blocked…take steps to have it cleaned, in the interim,” she told the residents. For her part, JEEP’s Programme Director, Carolyn Gardner, also welcomed completion of the West Road project, which she noted started under the tenure of her predecessor, Lucile Brodber. Member of Parliament for North East Manchester, Audley Shaw, expressed gratitude for the stakeholder collaboration involved in repairing West Road and other corridors in the constituency, under JEEP. Speaking on behalf of the citizens, West Road resident, Howard Bennett, expressed thanks to Councillor for the Walderston Division, in which the corridor is located, Burton Wright, for his representation on their behalf to have the road repaired.